Nepali [originally known as Khaskura, and now as ‘Gorkhali’] is a distinct language, but closely related to Hindi, It is the official language and mother tongue of Nepal, which has approximately 122 distinct languages, whilst the government of Nepal also recognises 59 indigenous nationalities (termed in Nepali Adibasi Janajatis). Approximately 75% of the languages of Nepal belong to the Tibetan-Burman language group, including Nepal Bhasa (original language of the Kathmandu area and its Newari population), Tamang, Magar, Rai & Limbu. 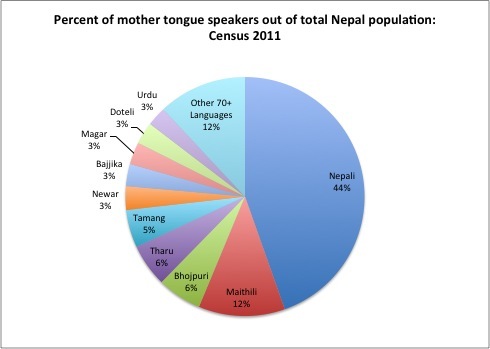 After Nepali [44.6%], Maithili is the second largest single language spoken [11.7%]. English is commonly spoken to a high standard by those belonging to the educated population, and is the only language used in msany higher education sectors; the country also has an increasing number of English language colleges and schools, and extensive needs and wishes of Nepali schools to develop contacts with UK ones. In the UK Nepali is taught at SOAS and at Oxford University. The population of Nepal is approximately 26, 500,000, excluding its overseas diaspora, numbers of which exceed 500,000 in some Middle-Eastern / Gulf countries, whilst in the UK official estimates place the population at, at least 75,000+ (although other estimsates consider it to exceed 100,000).